Brooklyn, NY - Homeless people residing in the Brooklyn neighborhood of New York City will have a place to get clean thanks to a new planned mobile shower service made from a converted school bus. Brooklyn Borough President Eric Adams, a Democrat, made the announcement Wednesday, saying his office will help fund the project. 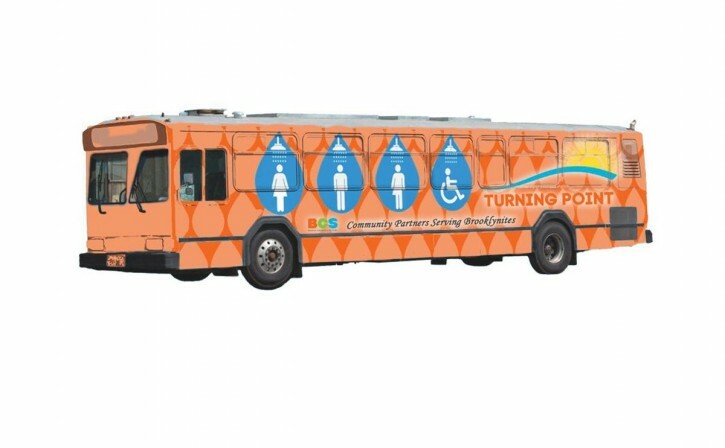 The program will have two shower stalls housed in the bus traveling through different neighborhoods in Brooklyn, complete with soap, clean towels and clean undergarments. A brand new project for New York, the program is modeled after a San Francisco initiative that turned a bus into a shower on wheels. The bus will be managed by the nonprofits Brooklyn Community Services and Turning Point. It’s expected to take a year for the bus to be up and running. Can we get a mobile mikva or shvitz too? eric adams must have gotten a donation from the owners of this company he is pay to play and is very tight with Satmar. why should this take a year? If someone private built this is would take a few weeks. Our government at it's best. That's men, women or intersex/non-binary. Why does it have to be on wheels? I'm not on Medicaid, but I am unskilled....particularly at cleaning. And I can tell you that if I were tasked with cleaning this bus, it would probably explode. A better solution for people who claim to be unskilled is to provide them with a mandatory education. They will need more than one bus!! Can't wait to see liberalism vs. liberalism. Unisex showers can have loads of safety implications. Interestingto see how this will play out. Cool. Such a service would also be useful when there is a natural disaster. One of the detergent companies has a bunch of trucks that provide emergency laundry services after a hurricane or fire. Great idea. I work hard cleaning, it's just that the stuff I clean gets destroyed in the process. Park it mid-week in Williamsburg - an erev Shabbos dunk in the mikvah is not counted as a shower. And throw in some clean underwear as well.